Dance and Drama student at The Sixth Form College, Solihull put on a Christmas Showcase this week to give staff, parents and students a look at the work they are doing in their studies this year. The Performing Arts Christmas Showcase included 13 dance and drama sketches during the evening performance. Both A level students and those participating as an enrichment activity took part, with Christmas-themed performances from the enrichment students. Those in the Performing Arts Academy put on a short Physical Theatre version of ‘A Christmas Carol’, while those in the Collision Dance Company put on a routine called ‘Christmas Lights’ to a Coldplay song. 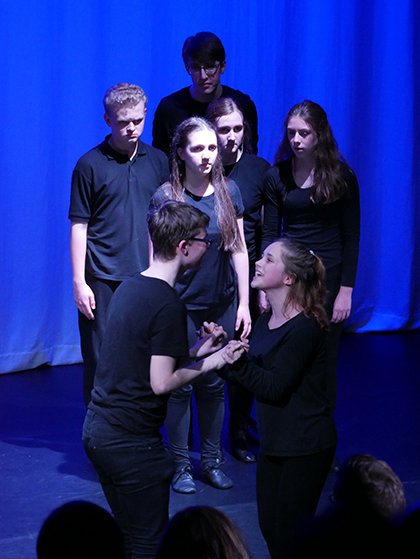 Among the A level Drama performances on show were scenes from ‘Our Country’s Good’ by Timberlake Wertenbaker and ‘Antigone’ by Sophocles. Among the Dance performances were some duets and group choreography, including a performance called ‘Revelations’ which was choreographed in the style of American Dance Theatre company Alvin Ailey. “The Showcase was a wonderful opportunity to share the excellent work our Dance and Drama students have been doing this term. We also have students who do not study either subject at A level, but very much want to be involved in a creative project, so this Showcase was the culmination of their efforts this term too.